Suan Dusit Rajabhat University released survey results on the public’s opinions of the National Council for Peace and Order (NCPO) and the topic of happiness. The online survey was conducted on 10th – 14th June with 1,634 participants from around the country. On 15th June SDRU release their Suan Dusit Poll data concerning the public opinion of the NCPO three weeks after the military junta declared a coup in Thailand. Since then, the country has been run by the armed forces under command and control protocol since 22nd May 2014. Excellent news, but for me, not surprising. The NCPO tasked 10 government agencies relevant to education to come up with more viable projects for consideration (books, maybe?). Former Prime Minster Yingluck’s legacy: tablets high-speed rail, rice (vote) buying scheme, amnesty for her brother, Toxsin. Shoot, Yingluck is another George W. Bush! More than 120,000 Cambodians have fled Thailand to return home in the past week, fearing a crackdown on migrant workers after last month’s military takeover, an official said on Sunday. The mass exodus of labourers – who play a key role in Thai industries such as seafood and agriculture but often lack official work permits – comes amid a junta warning of arrest and deportation for illegal foreign workers. “They’re returning en masse like a dam collapsing. 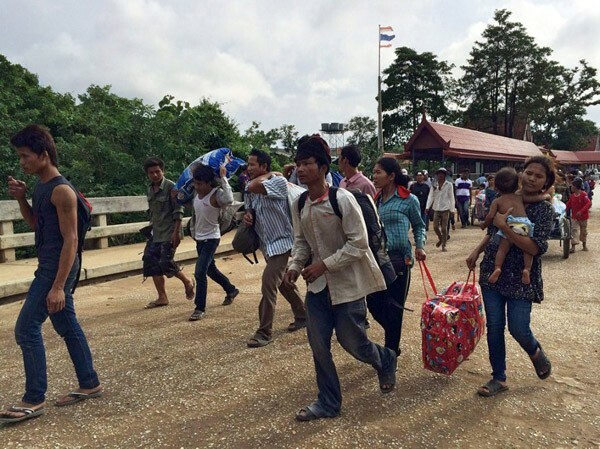 They’ve never come en masse like this before in our history,” Kor Sam Saroeut, governor of the northwestern province of Banteay Meanchey where the main border crossing is located, told AFP by telephone. Around 122,000 Cambodian migrants have returned from Thailand in the last week after being transported to the border by Thai military trucks or making their own way, he said late Sunday. More than 12,000 migrant workers crossed the border into Cambodia on Sunday alone, according to Saroeut, who expects many more to make the journey over the new few days. Thousands were sheltering from the rain at local Buddhist temples and a market as they waited for transport to their home provinces. Cambodian authorities have arranged nearly 300 cars and military trucks to ferry workers home from the Aranyaprathet-Poipet border checkpoint but many would have to stay near the site overnight until transport became available, Saroeut said. At the smaller border checkpoint of Boeung Trakuon, south of Poipet, around 1,000 Cambodian men and women walked across the border with heavy bags and children in tow, said a local journalist. Sirichan Ngathong, a spokeswoman for Thailand’s army which seized power in a coup on May 22, had said Wednesday the junta viewed illegal migrants as a “threat” and they faced arrest and deportation. I haven’t read anything similar as to whether this is affecting the Lao and Burmese. If the crackdown becomes more widespread, I believe this will have a dire consequence on the Thai economy.